<VantageVPS> offers fast and reliable Virtual Private Servers with pure SSD storage and guaranteed server resources for your VPS hosting needs! For a limited time only, enjoy 15%* off our Europe and USA servers with a 6-month sign-up. *Whilst stocks last. Discount applied at checkout. Renewals would be at regular price. What's your actual advantage from other "big" player from VPS hosting services? 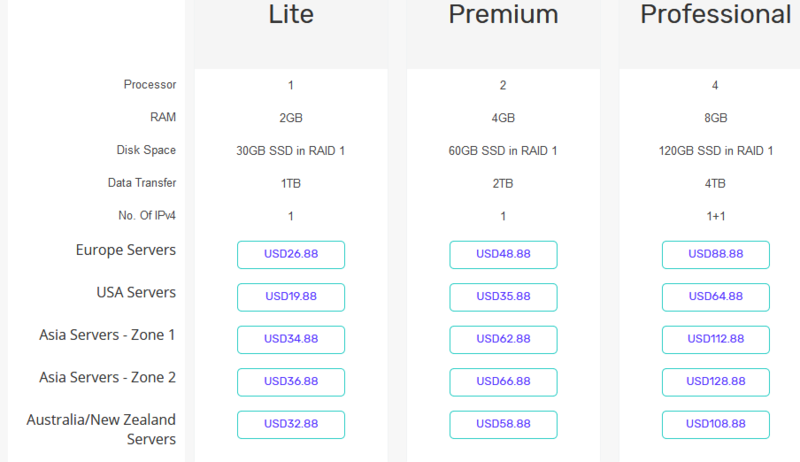 I got $10/mo for 2GB RAM at 55GB SSD disk space at Vultr for all location, while you offer $19.99/mo only for US location and cost more at other location. For example, you ask for $34.88/mo for Singapore location with 2GB RAM and 30GB SSD, but Vultr (and even DO) ask lower than that. I want to know your "real" advantage and why we should buy/rent a VPS from you. Thanks to HostDoc and Post4VPS for providing me excellent VPS 13! Agreed with @tiwil. I find all of the products very pricey. Also, what is the connection speed of the VPSs, as I couldn't see that from the Website? There is 15% discount on the prices below. Even with the discount it looks high. Looks like a very professional business however when one checks through the Website - could be their VPSs are top notch. Just a little out of my price range however. I think you should think again at the price!